PALM BEACH, Fla. – March 7, 2018 – Barrett-Jackson, The World’s Greatest Collector Car Auctions®, will offer an amazing selection of collectible convertibles and roadsters in the Sunshine State during the 16th Annual Palm Beach Auction, April 12-15, 2018. Among some of the most anticipated convertibles already consigned to cross the auction block at the South Florida Fairgrounds is a Volcano Red ’13 McLaren MP4-12C (Lot #726) with only 305 actual miles and a Cortez Gold ’71 Buick GS Stage 1 (Lot #424) muscle car, which is one of only 72 Stage 1 automatic convertibles built. The docket of covetous convertibles crossing the block in Palm Beach includes a ’55 Packard Caribbean Convertible (preview), which is #244 of 500 produced and is finished in Rose Quartz, Gray Pearl Poly and Jade White. A great addition to any collection is a highly optioned ’72 Oldsmobile Cutlass Supreme Convertible (Lot #648.1), which is one of 1,171 convertibles made for 1972 and includes a matching-numbers 455ci engine mated to a Turbo 400 automatic transmission. A ’67 Chevrolet Corvette 427/390 Convertible (preview) has all of the charm of a classic Corvette with a complete frame-off restoration and modern upgrades like Bluetooth radio. 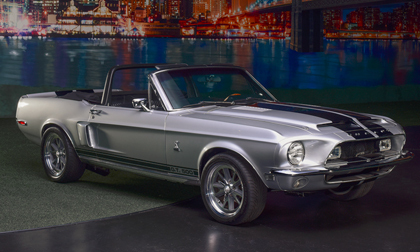 Staluppi’s collection will include some truly remarkable convertibles and roadsters, including an original ’68 Shelby GT500 convertible (Lot #714), which is one of just 402 convertibles built in 1968. A true head-turning roadster is a show-quality ’30 Ford Hi-Boy Custom Roadster (Lot #688.1) that was a no-expense-spared custom build by Tom Beard. Also included in the Cars of Dreams Collection is a multiple award-winning ’60 Chevrolet Corvette 283/290 Fuelie Convertible, which is finished in a one-year-only Tasco Turquoise with matching interior. The Preview Docket for the 2018 Palm Beach Auction, along with additional event details, are now available at Barrett-Jackson.com. For more information on becoming a bidder for the 2018 Palm Beach Auction, including the John Staluppi Cars of Dreams Collection and the South Florida Collection, follow the link to www.Barrett-Jackson.com/bid. To submit an application to consign at the 2018 Palm Beach Auction, click here.